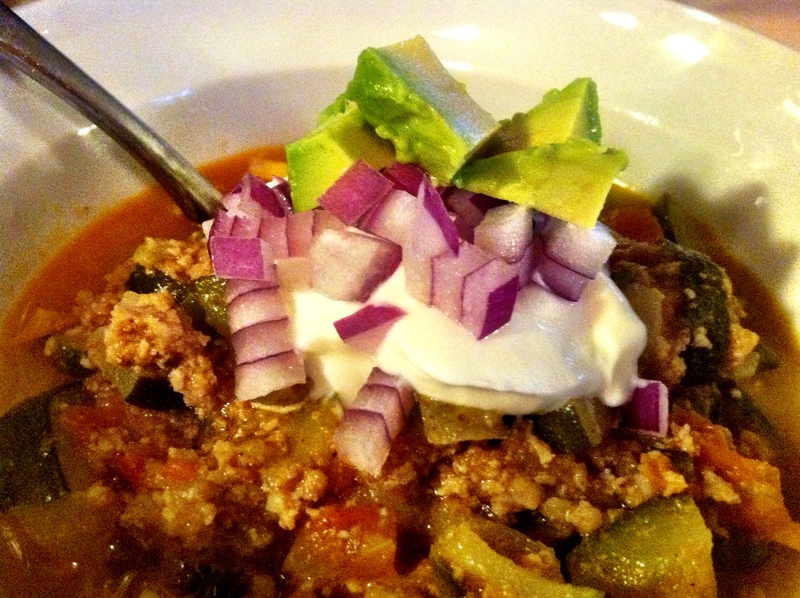 If you’ve been following my blog or just know me, you know every Christmas Eve I have to have my mom’s turkey chili. It’s been a tradition in my family since I was a kid, but for the past couple of years, my mom has been begging me to pick something lighter to eat the day before Christmas. Being the nostalgic nerd that I am, I just can’t let go, so I started searching. Every chili recipe I found required canned tomatoes and/or tomato paste. With all the controversy surrounding canned tomatoes, I’ve been staying away. Finally, I found it. 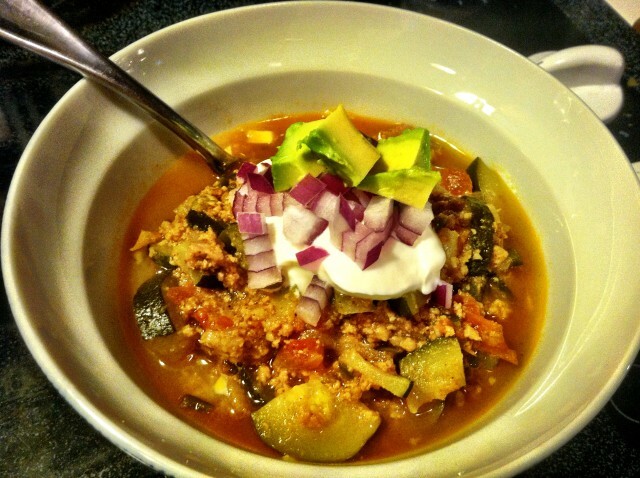 A healthier version of turkey chili from Nombudsman. I used their recipe as a base and then made it my own. There’s no way my mom will have issues with this recipe, because it uses fresh tomatoes instead of canned AND fresh zucchini. The more veggies we can get in the better, right? Even though tomatoes are not in season right now, I can usually find Mexican organic ones at my local co-op. If you were smart enough to plan ahead and freeze your tomatoes from the summer– you are ahead of the game. Congrats! I was not as smart. 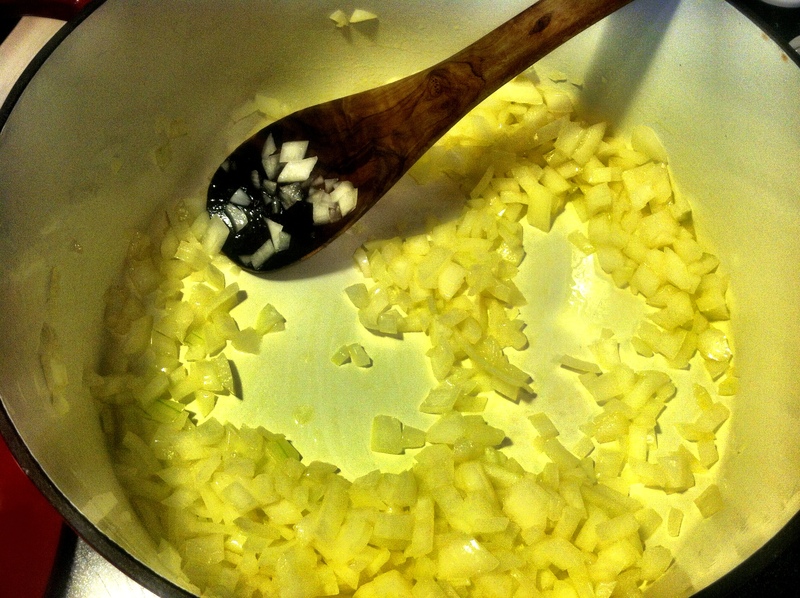 In a large pot or dutch oven, sauté diced onion in some olive oil on med-high. Get some color on the onion, but make sure you don’t let it burn (about 5 minutes). 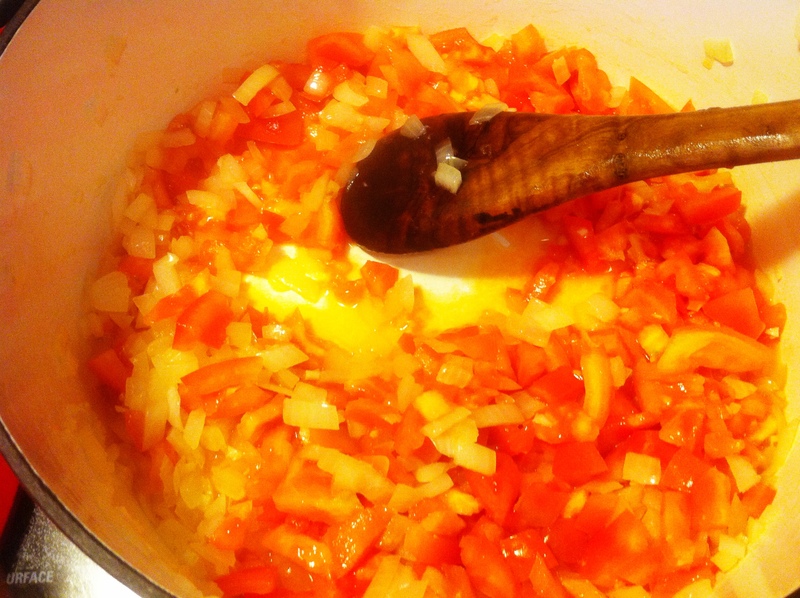 While the onions are cooking, prep your garlic and tomatoes. 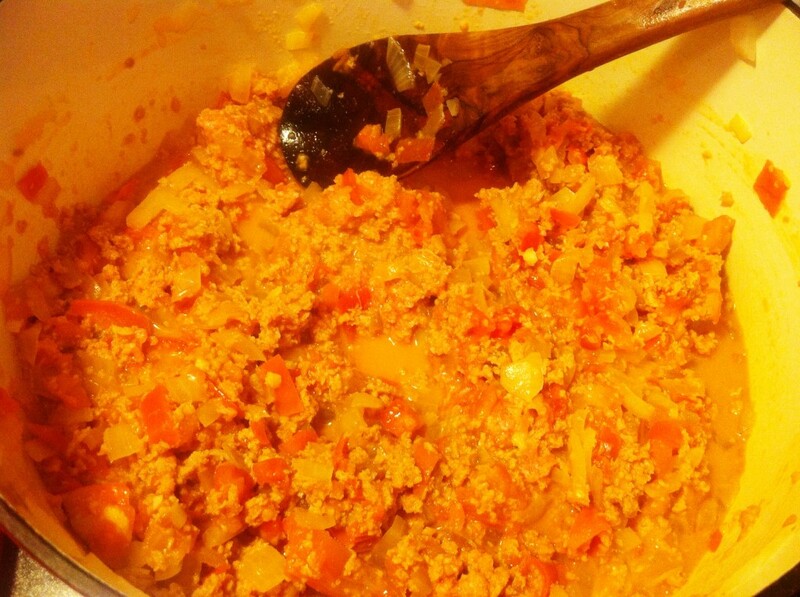 Add the minced garlic and stir, keeping heat fairly high, about 2-3 minutes. Next, add the tomatoes. Cook for a minute or so then turn down heat to medium. Cook for about 10 minutes to release their liquid. You may want to cover the pot half way through so you don’t lose too much liquid. Once the tomatoes have softened, add ground turkey and break it up so it’s in small pieces. Mix evenly. 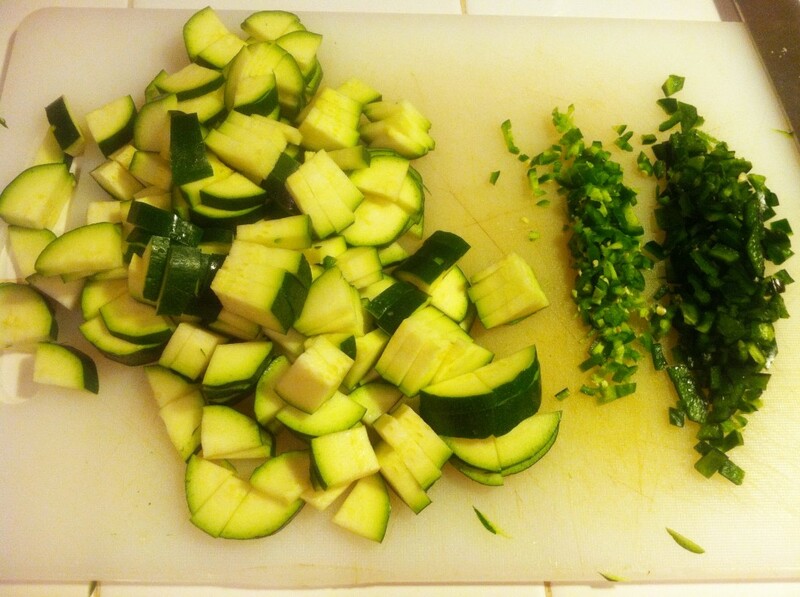 While the turkey is cooking, dice up peppers and chop zucchini. Once the turkey has cooked, about 5-8 minutes, add the peppers and zucchini. Next, add the beans. If using canned beans, make sure to drain and rinse them. 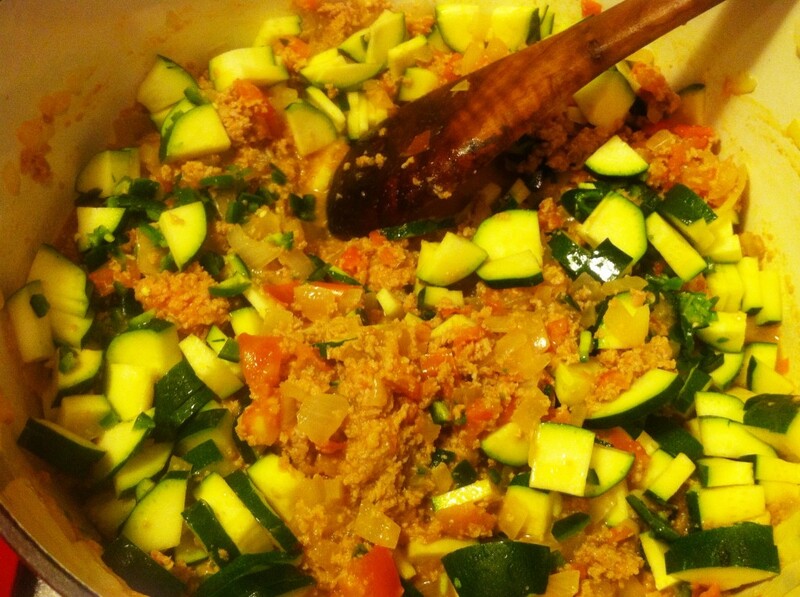 Now stir in the spices and mix well. Turn down heat to low, and either add Greek yogurt now to the whole batch to give it a creamy texture, or add a spoonful to each serving. Some people may not want dairy, so I usually leave it up to them. Top with cilantro, red onion , feta (or your favorite cheese) and crumbled up tortilla chips (I like to mix my chips in it).